Earlier this week, we celebrated Earth Day. The point of Earth Day is to recognize the importance of the environment, and make an effort to improve our own efforts. 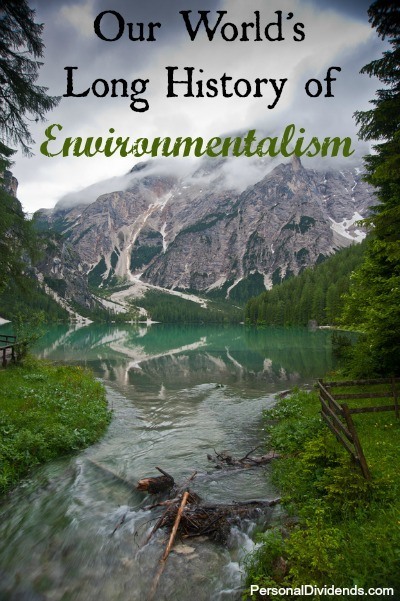 However, environmentalism isn’t a new idea. Even though there has been an upsurge in environmental interest since the effects of pollution have become increasingly obvious, there has almost always been an interest in nature, and in protecting the environment. According to Philosophy Now, the ancient Cynics of Greece were among the first environmentalists. Believing that it was important to live as naturally as possible, and live in harmony with nature, the Cynics were known for despising social niceties and consumerism. Even those who look to ancient scriptures for inspiration fancy an environmental message. Rabbis have interpreted the “dominion” mentioned in the Torah to mean that humans have to be righteous in order to rule — and that ruling doesn’t mean destroying. Christians are also looking to ancient ideas of dominion, and connecting it more with stewardship. Instead of being a harsh situation of destruction, some Christians consider this dominion to be more of a care-taker status. Ancient Indians also offer insights into human responsibilities to the environment in the four major Vedas. Hymns referring to the environment, its maintenance, and the bounty of Earth are all included, and provide some instruction as to how to proceed. In many cultures around the world, it has long been recognized that a certain amount of care is required toward the environment. There is also a long history of environmental laws. Wikipedia offers an interesting list of environmental laws, starting with a law protecting the birds on the Farne Islands in Northumberland, UK, in 676. Most environmental laws in the beginning dealt with sanitation issues. Laws like that passed in the city of Paris in 1366 requiring butchers to take animal waste beyond the city for disposal, as well as the English Parliament’s ban on throwing garbage into water sources in 1388, were aimed at avoiding disease. However, there were very few laws aimed at actually protecting the environment. One of those few laws was an interesting requirement in Pennsylvania as it was being settled. In 1690, Governor William Penn stipulated that one acre of trees had to be preserved for every five acres that were cleared. As the settlers came to the New World they were required — at least in Pennsylvania — to leave some trees standing. Since then, insights on the environment, and laws aimed at reducing some of the human impact have increased, especially with the advent of the Industrial Age, and continued use of fossil fuels. Even now, debates rage over the best way to help protect our natural resources and the environment. In my town, the debate revolves around dirty air, since a weather phenomenon known as an inversion traps pollution in our mountain valley during the winter, making it some of the dirtiest air in the country during the colder months. Since ancient times, we’ve recognized the importance of the environment. What’s hard is balancing it with human desires and progress.